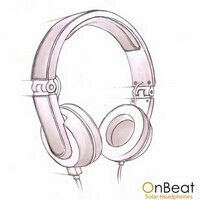 On with the beat we go with this Kickstarter project – the OnBeat Solar Headphones. As the name implies, there is a solar panel on the band of the headphones, allowing it to capture sunlight and transform it into energy, which is then stored in two light-weight Lithium Ion batteries. Pretty much any USB device can be charged with the reserved energy source, yet it is not certain how much juice you'll get from the OnBeat. Some would say that those will be useless on rainy days. Well, think twice, because the OnBeat can be charged via USB from your PC or straight from the mains socket. Also, no more pulling out your phone to raise the volume for that awesome track – the headphones have a volume rocker integrated into them. The funding period ends on August 7, so if you like the idea behind the OnBeat, make sure you hit that “Back This Project” button. Please don't listen to headphones while "just cruising to work." Thanks.